Nasrallah: "Trump's behavior shows he is unpredictable, and could launch any action in the region at any moment and encourage Israel to act as well. We want the Resistance Axis to be prepared to turn this threat into opportunity, and have already begun planning." Hassan Nasrallah is the current Secretary General of the Lebanese political and paramilitary party Hezbollah. BREAKING: 7 Russian jets destroyed in attack on Hmeymim airbase. Mortar fire destroyed 4 Su-24 attack aircrafts ,2 Su-35С air defense fighters, 1 An-72 transport aircraft + an ammunition depot detonated after mortar strike (via @anton_mardasov). Earlier 1 copter downed, 2 pilots dead. Russian paper reports an attack on Russia's airbase in Syria. However, we doubt the incident indeed took place. Opposition “mortar” fire destroyed x6 Russia jets & 1 transport plane on Dec 31. According to late-2017 estimates, that suggests 15-20% of Russia’s fixed wing deployment in Syria was destroyed in a day - by “mortar” fire. BREAKING: US hands over list of 27 terrorists from Haqqani Network operating on Pakistan soil to Islamabad. Asks to act against LeT, JeM, HM also. Asks to kill or hand them over. Action taken report to be submitted to US by January 15. Clock is ticking backwards for Pakistan. The U.S. failed to behave as an ally and turned Islamabad into a “whipping boy” for its own shortcomings in Afghanistan, Pakistan’s foreign minister said, after the Trump administration suspended security-related aid to the country. There are other countries that could ally with Pakistan, Mr. Asif said. Last year, he rallied officials from China, Iran, Russia and Turkey behind Pakistan’s strategy for Afghanistan, a process centered on peace talks with the Taliban. Following Mr. Trump’s tweet against Pakistan this week, China foreign ministry said it was “ready to promote and deepen” its cooperation with Pakistan. Armed drones have targeted Hmaimem air base on the Syrian coast & Russian soldiers are trying to block them w/anti-aircraft weapons. Sirens went off a short while ago. 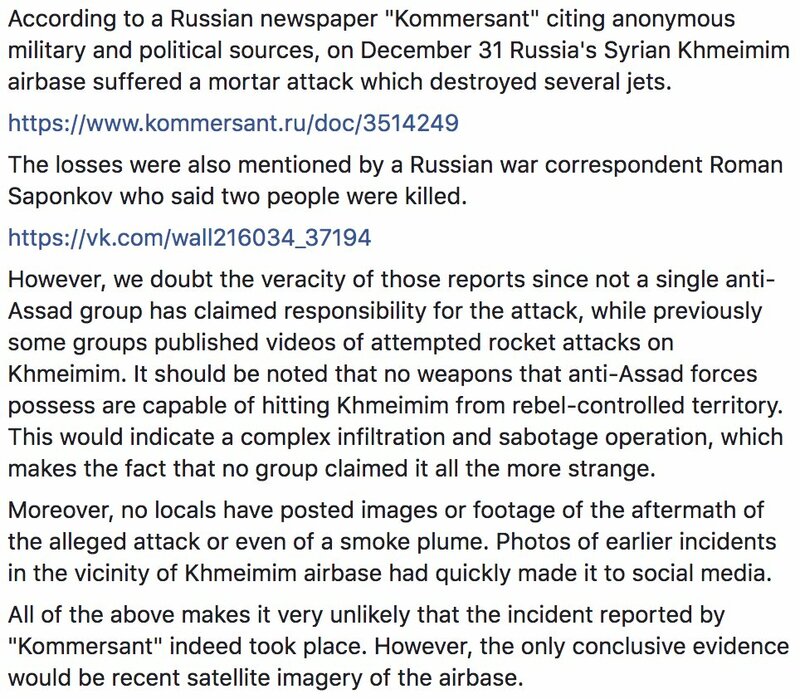 Hmaimem air base's official FB page also posted news that they were "dealing with" enemy forces attacking the base. FSA Free Alawite Movement claim responsibility for the Hmeimim drone attack taking out an S-400 Missile System, stating that Russia will not be able to stay in Syria for more than 6 more months, and promising “painful” days for them especially before Putin’s next election. Ahrar Al-Alawi (Alawite Rebels) claims responsibility for bombings in Hmeymim airport. The Palestinian Authority is pushing public protest in the West Bank in response to Trump's recognition of Jerusalem as Israel's capital and amid U.S. threats to cut aid to refugee aid agency. A senior Western official told @ibrahimhamidi that the United States is planning to unveil a new strategy for the SDF-held areas of Syria, which may include some form of diplomatic recognition. Russia confirms drone attack on Khmeimin air base, Syria. SYRIA: Security system of the Russian Khmeimim air base and Russian Naval CSS point in the city of Tartus successfully warded off a terrorist attack with massive application of UAVs through the night of 5th – 6th January, 2018. With regard to Bannon's plan on the West Bank and Gaza, it is highly unlikely that Jordan and Egypt would agree, since both countries are already dealing with many other internal problems and would not benefit from taking millions of Palestinian under their control. 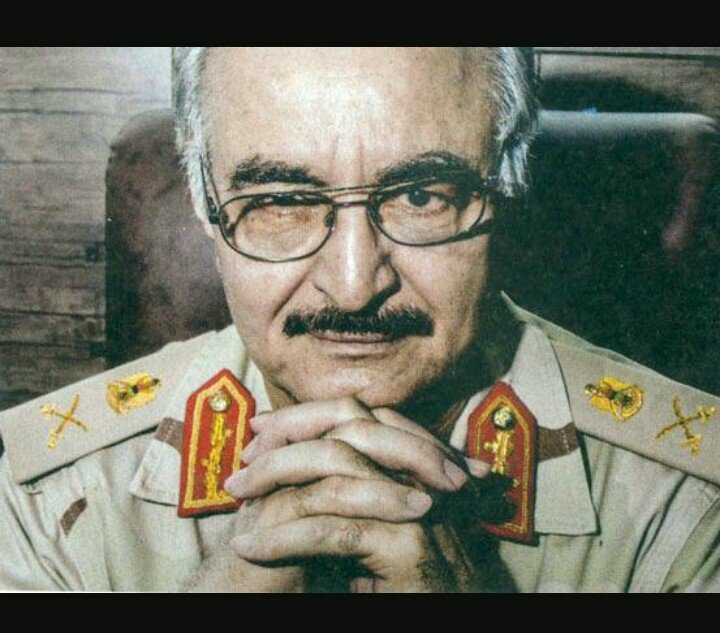 Libya is not yet ready for democracy, warlord Khalifa Haftar tells Jeune Afrique magazine, threatening that if upcoming elections fail, he will take action. Syria - SAA General Command: Israeli AF carried out 3 attacks targeting military area near Qutayfah in rural Damascus, anti-air systems responded.